The choppy recovery in U.S. housing surged in April with housing starts bouncing back 6.6% from the pace in March. The Commerce Department said builders began construction of 1.17 million residences, on an annual rate. Single-family houses appeared to be regaining momentum after a recent surge in multi-family structures. Building permits for future construction rose at an increased pace from March but lagged filings from the year before. The broadest measure of inflation suggested continued moderate economic growth in April. The Consumer Price Index showed core prices – excepting food and energy – rising 2.1% from the year before. That makes six months in a row at or above the 2% mark, which the Federal Reserve Board has set as its inflation target. However, the Fed prefers measuring inflation through another gauge, most recently showing a 1.6% annual rise in prices. According to the Bureau of Labor Statistics, the April CPI reflected an 8.1% rise in gasoline prices. The Federal Reserve reported that industrial production gained in April for the first time in three months and at the highest rate since November 2014. Output from manufacturing, mining and utilities rose 0.7% from March, with factories – contributing three-fourths of all production – gaining 0.3%. Mining continued to decline with low demand for commodities, and utilities recovered from an unusually warm March. 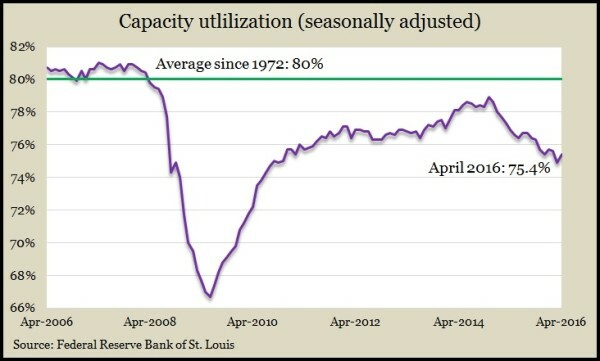 Capacity utilization ticked up along with the output but remained below the long-term average, above which economists worry about inflation pressure. All but one of the 10 components in the leading economic indicators suggested further progress for the U.S. economy in April, resulting in the index’s first gain since November. Interest rate spread, factory hours, building permits and jobless claims led the list of contributors, according to the Conference Board. Consumer expectations gave the only negative indication. The business research group sees moderate economic growth continuing in 2016. The moving four-week average for initial unemployment claims rose for the third week in a row, reaching its highest point since February. For the first time since November 2009, the average showed a year-to-year gain, although it remains 23% below the all-time average, suggesting continued reluctance by employers to let their workers go. The annual sales rate of existing homes increased in April for the second month in a row, according to the National Association of Realtors. Realtors sold at a 1.7% higher pace than in March and 6% ahead of the year-ago rate. An economist for the trade group expressed concern that first-time home buyers might get priced out of the market as a short supply of houses has fueled price increases. The median sales price rose 6.3% from April 2015 for the 50th consecutive year-to-year increase.